Artists, especially photographers are an insightful bunch. They spend the best part of their time carefully moulding visual interventions and peddling our most colourful fantasies and banal realities back to us with edifying flair. If photography has taught us anything over the years it’s that aesthetic disciplines often present the most striking means of communicating socio-political commentary. Lorenzo Vitturi’s visual project Dalston Anatomy, a series of sculptures, installations and photographs featuring and inspired by Dalston Market and the buzzing culture of Ridley Road are a gorgeous testament to photography’s vocal and synaesthetic power. These pieces, currently filling The Photographers’ Gallery, are alive with contrasting colours that sizzle and raw materials straight from the stalls of the market, presenting an honest and vital portrait of Dalston’s unique character whilst interrogating the political atmosphere, cultural evolution and inevitable gentrification of the area. During a compelling Q&A Viturri was quizzed on whether Dalston Anatomy, rather than capturing the spirit of the market and providing a beautiful still life sequence that explored the here and now, might actually be contributing to the gentrification of the area. Contrary to this idea, we think this photographer has provided a stunning snapshot of real life and should be applauded for showcasing it within a remarkable cultural context. 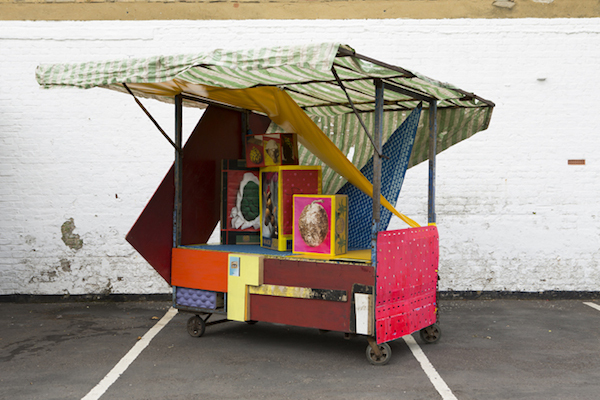 If you do one thing this summer, visit two places: Dalston Market and this exhibition. Both are free and both will imbue you with a sense of appreciation for London’s diversity, the cogency of photography and the universal language of sense experience.